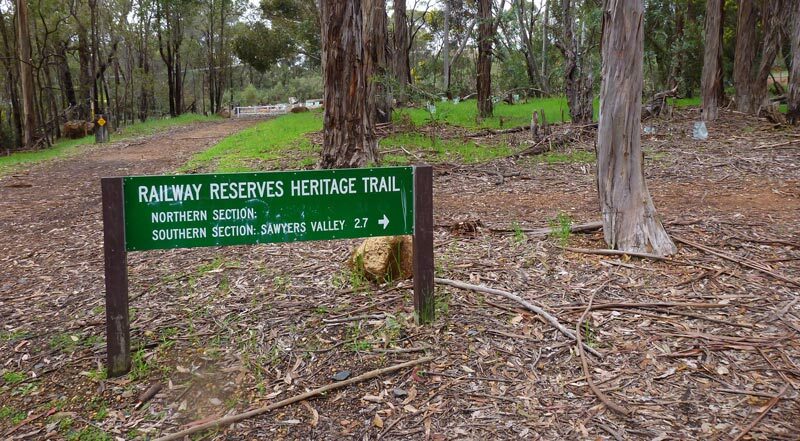 We’ve wanted to experience the Railway Reserves Heritage trail for a while now and with a promise of flowing waterfalls thanks to a rather generous winter season we thought it was perfect timing to put our plans into action. 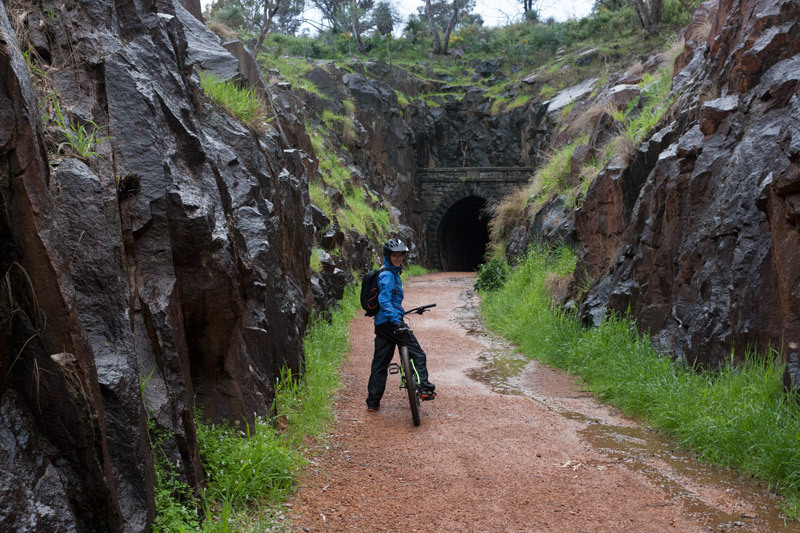 The 41 km trail loop traces the old eastern railway line, passing through neighbourhoods grown from early settlement towns and the state’s John Forrest National Park. Offering glimpses into Western Australia’s past, beautiful nature surroundings alongside opportunities of a wildlife encounter, and food and drink stops. This is a terrific trail of diversity. Not confined to cyclists, the trail welcomes hikers, and excluding national parks, horse riders and dog walkers as well. 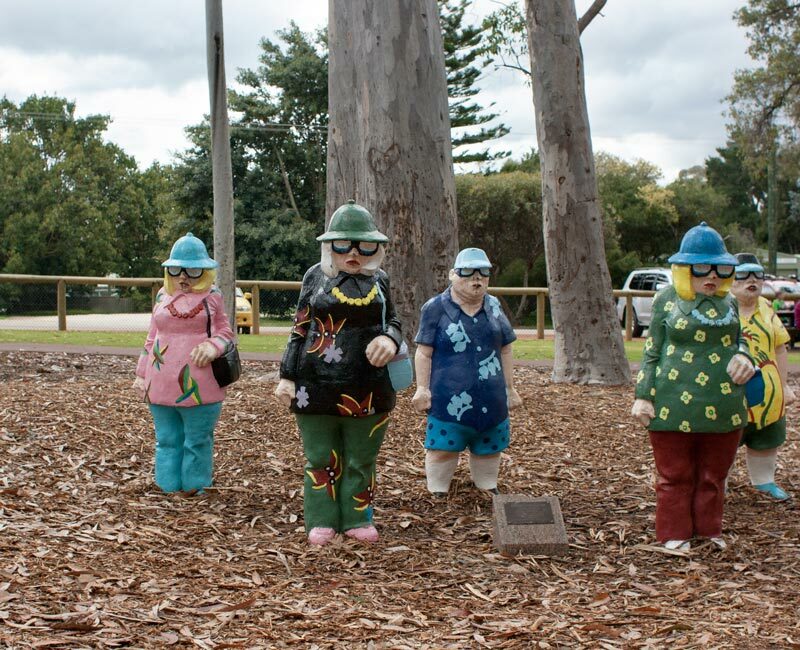 There are a couple of sections along the loop to join and we decide to park the car and ride from Mundaring Sculpture Park. 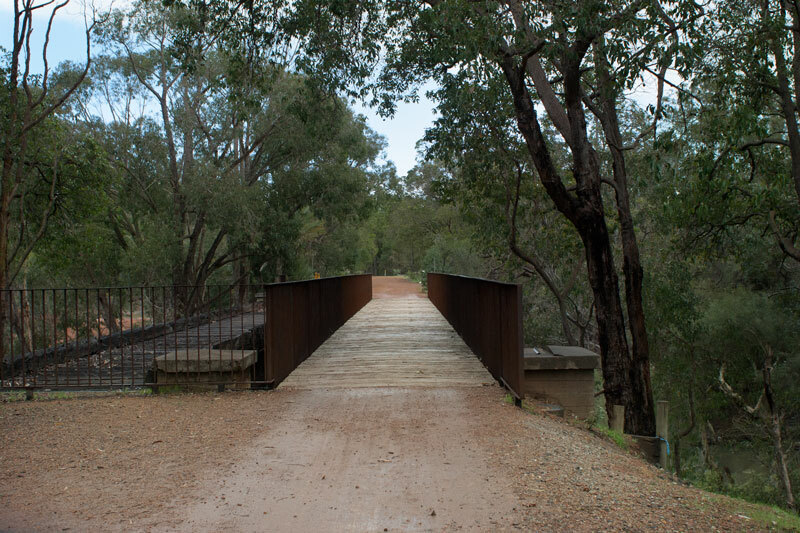 Mundaring Sculpture Park is also the very same location of the north terminus for the Munda Biddi trail, the start or end of the 1,000 km off road bike journey between Mundaring and Albany. 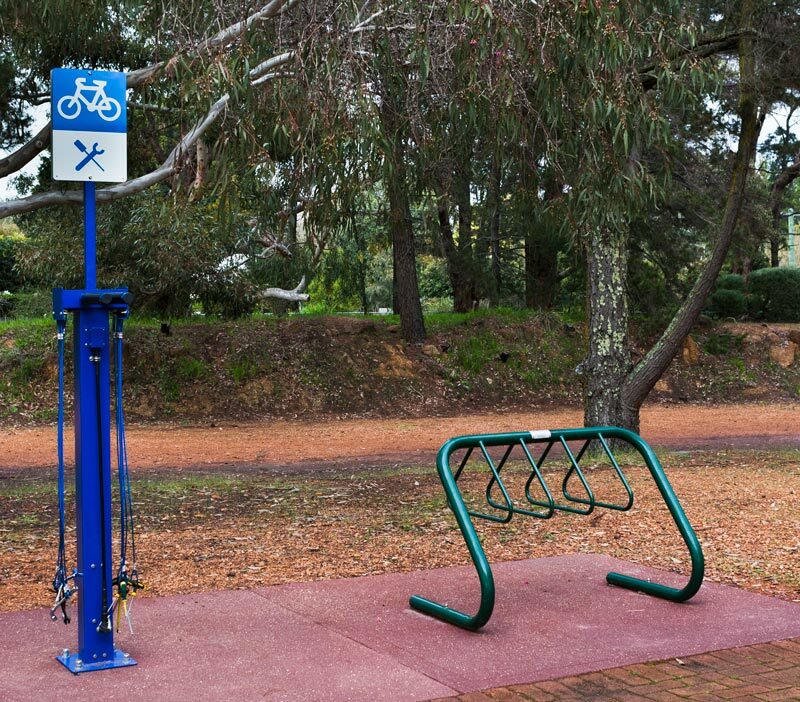 Conveniently there is a bike tool station to assist with any maintenance needed before the ride. The park facilities are overall fantastically presented and complemented with BBQ facilities. 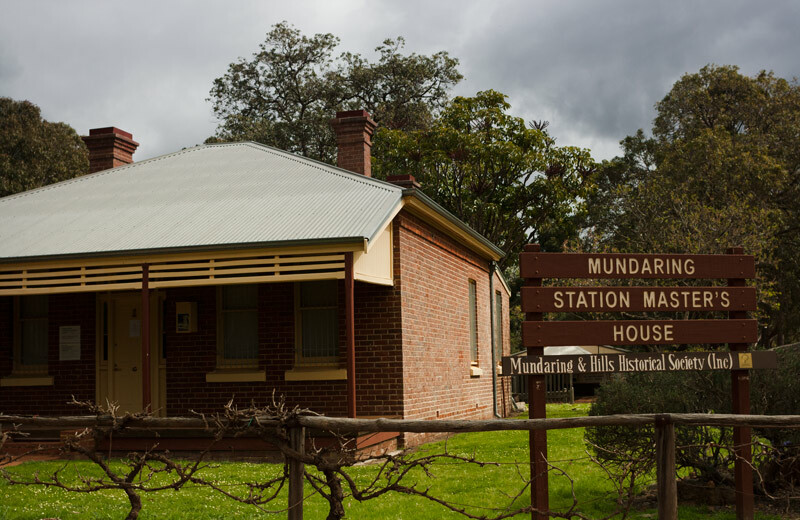 Mundaring Hotel is across the road and a row of shops can be found a little further away. Standing in front of the Rail Heritage Trail sign we were presented with two options – left or right. We opt for right in the direction of Bellevue. Leaving the sculpture park we pass one of the old station platforms on the trail. The ride along the first section of the former 1884 eastern railway is a cruisey downhill pace. It is near 8:00 am and the 5 degree chill in the air hits us head on, if we were sleepy we certainly weren’t anymore. 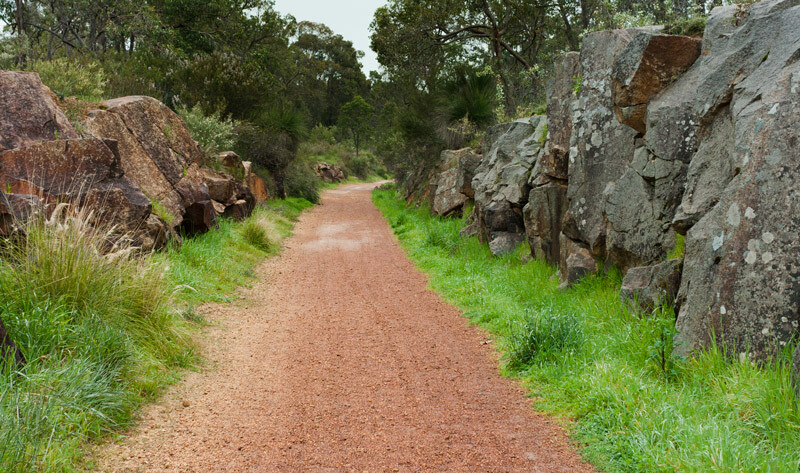 The trail is bordered by trees and shrubbery, at times a granite rock embankment rises on either side and it’s something we haven’t encountered whilst off road cycling before. 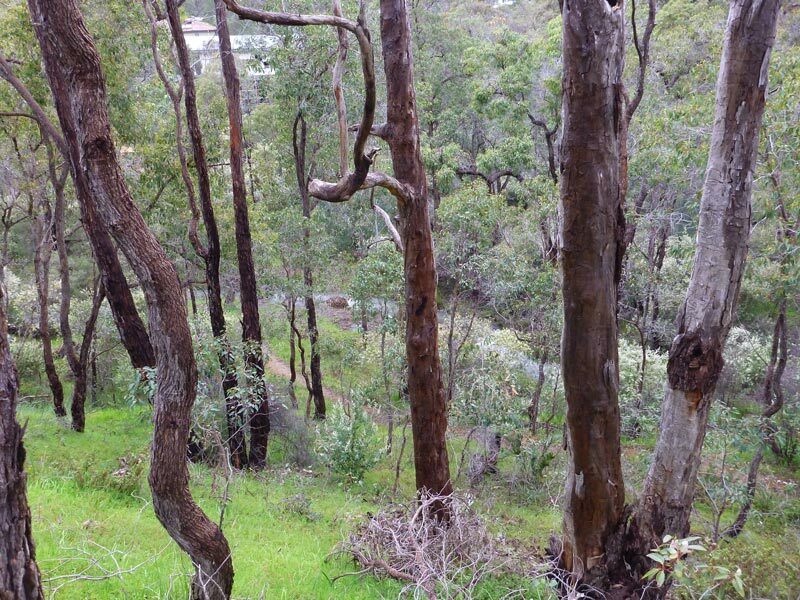 We make our way through neighbourhoods of Mahogany Creek, Glen Forrest, Darlington and Boya. The smell of wood fire stoves lingers in the air when the trail passes close to houses and even the smell of bacon – oh to be eating that! The trail cross a few streets and this requires careful attention. We leisurely pass through a number of green grassed park lands. There has already been ample opportunity to stop for a break. Glen Forest has a train themed playground and picnic area. We spotted Cafe 2 at Darlington and I believe there is one in Glen Forest close to the trail too. We keep moving on though. A light rain begins to fall and we pull over to put on the waterproof pants. They create an instant warmth and we’re riding comfortably. On the left of the trail, the terrain drops, Nyaania creek a seasonal creek is flowing beautifully and loudly. This section of the eastern railway was eventually abandoned because the route was a little too steep for the tonnage. The rail sleepers and line have been removed and we ride on a compact trail of clay and gravel. 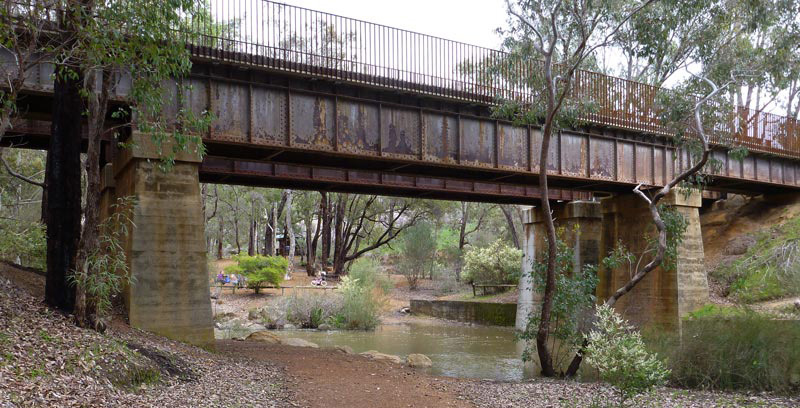 The Perth to Midland, an original section to the line still runs today, commuting people to and from Perth’s CBD. 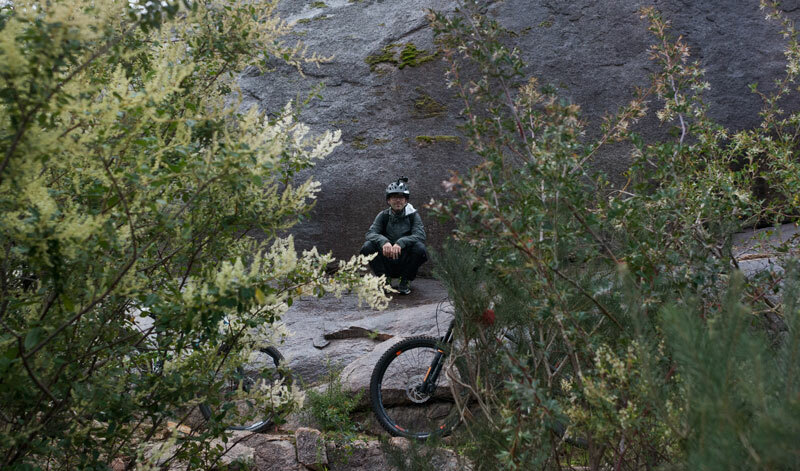 We cycle on the outskirts of Greenmount National Park, the location for the Goat Farm Mountain Bike Park. Even though the rain continues to fall we’ve encountered quite a few bubbly morning walkers, runners and riders, proving the trail’s popularity. The trail opens to some terrific views of the city below but with the rain we keep pressing on to cover the remaining kilometres. At Bellevue we almost miss the turn right onto Miller Street, however luckily the Garmin sounds off. We turn around and locate the sign, this segment departs the off road trail and we ride on the footpath through suburbia and under Great Eastern Highway. A printed map will prove handy in this segment. Elevation wise, we reach the lowest at 5 metres. In Mundaring we started at roughly 300 metres and enjoyed a lovely downhil ride. The end to the suburbia journey is marked with the rain stopping and when we see the old Swan View Station. We cross Swan View road before we reach the entrance of John Forrest National Park. As we started the trail outside of the national park we are not required to pay the entry fee, thrifty tip number 1. 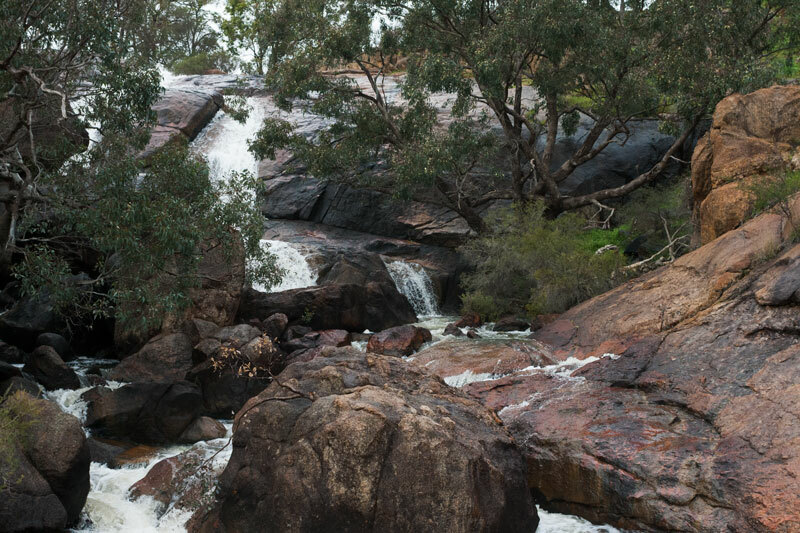 This is a popular segment because of the close approximately to the sights within John Forrest National Park, definitely convenient for anyone strapped for time. 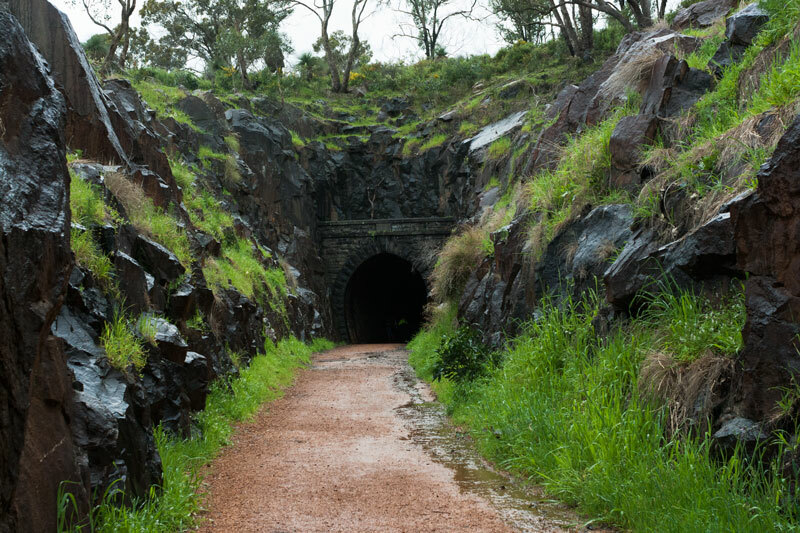 We approach the 340 metre long Swan Tunnel, the first tunnel in Western Australia. The rain adds a dramatic scene and the wet granite rock rises to the sky above. Excited voices escape the tunnel as we take in the surroundings and snap up a few photos. We bought along a small light on one of the bikes, however the tunnel turns dark very quickly and two lights would have been better. The floor was slippery and uneven, and the tyres made unusual crunching noises on the loose rocks. I recommend sure footing and lights for the tunnel. Also be careful the wall is quite sharp. We seemed to attract a bit of attention riding through with a small tour group snapping at us and we had a little chuckle at our short lived popularity before realising there was 21 kilometres left to cover and only 1 banana left! If the idea of walking through the tunnel is not to your liking, there is a path around that provides a quieter journey and some amazing views. From the tunnel we are treated to the nature highlights of the trail. 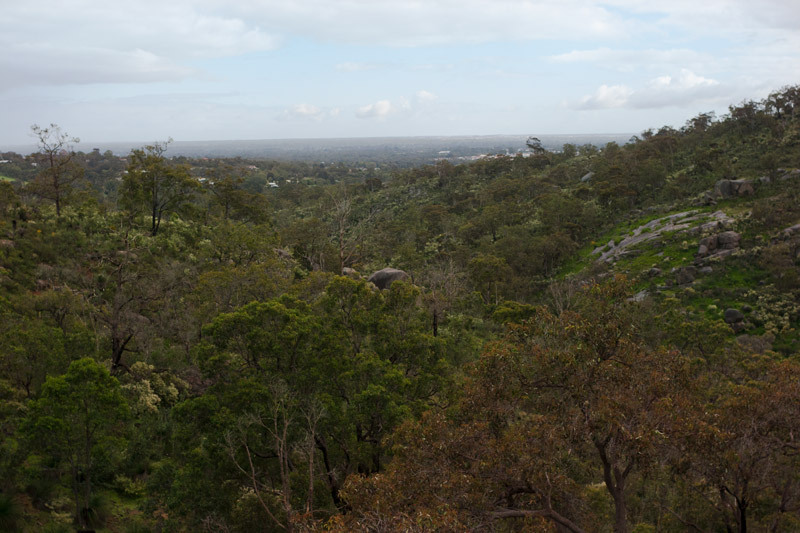 Views across the Swan coastal plain, we’re standing above the treeline and it’s a good spot for bird watching. Kangaroos are quiet animals and blend perfectly into the bush but we manage to spot one hopping on towards a clearing. The National Water Falls was beautiful to take in. 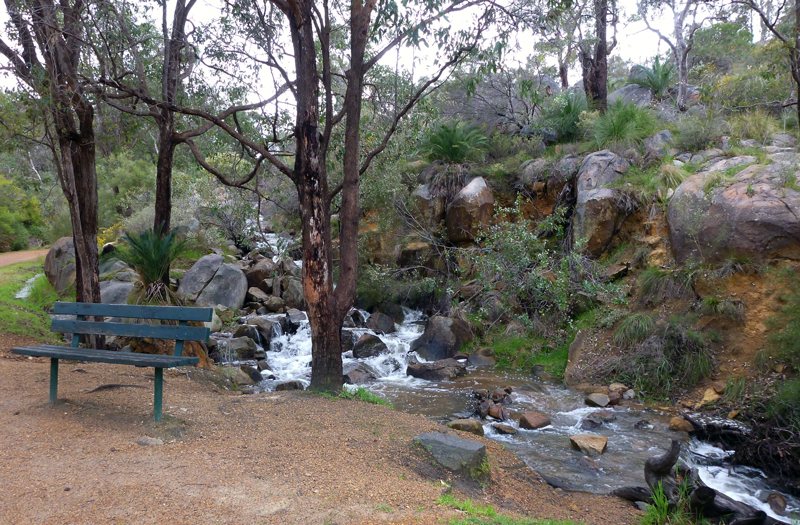 And I have to say living in Western Australia it’s an absolute treat to see and hear flowing water. We slip off the trail and walk down to a platform below the falls. There is a 15km hiking only trail called the The Eagle View Walk Trail. The Life of PY has nicely captured the walk here. 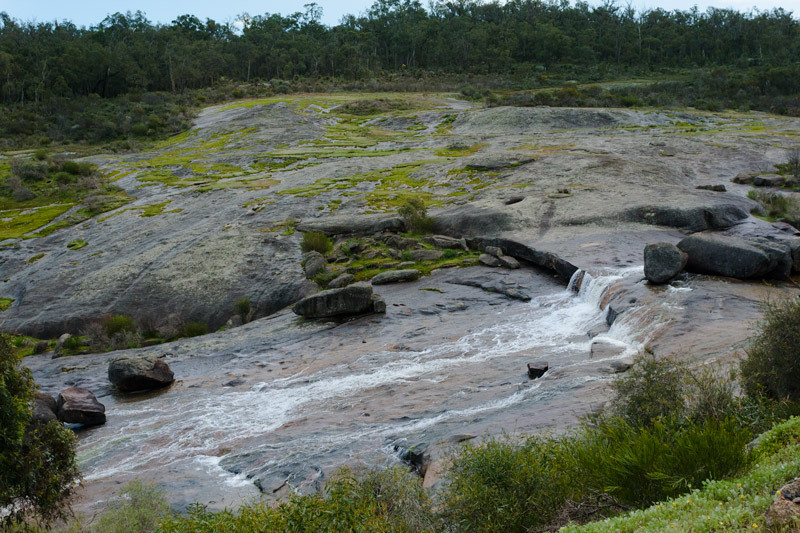 Further away we pass Hovea Falls, and with the height of the trail, we’re looking down and across the open and gentle sloping granite rock. Pedalling onwards we discover a small picnic area and Jane Brook off to the side of the trail. We cycle over remnants of an old railway bridge and there is a great vantage point of the original pylons from below at the picnic area we passed previously. We cross two more bridges after this. Leaving Western Australia’s first national park we ride through Parkerville and Stoneville. The trail traces the rear of semi rural houses. We hear the local birds the most in this section. We pass two random drinking fountains and a couple of park benches so there is opportunities for breaks. It’s straight and quite long. 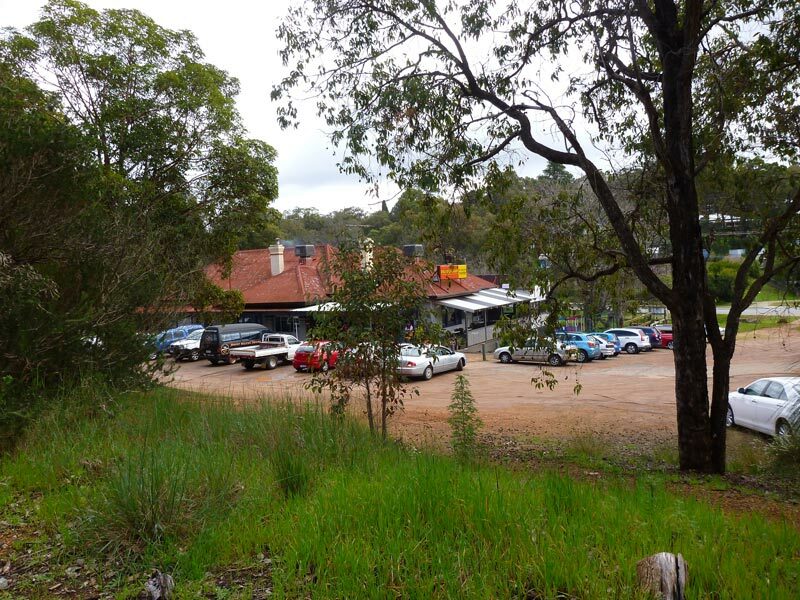 We spot a pub from the trail at Mt Helena before veering right towards Mundaring. If we were to travel straight we’d be on the eastern section which extends to Wooroloo and travels on the kep track to Northam. The pea gravel is a little loose in this section but no big deal. The bush rises either side of the trail. We spot a hidden dirt jump section and as the pipe line appears this indicates we are closing in on Mundaring. We cross Great Eastern Highway which needs careful attention as it can be quite busy. We’ve noticed most riders doing the trail in the opposite direction to us and we begin to think about this. Looking at the gradient, we climbed for a longer period compared to the other direction. We might try the other direction next time to compare. We really enjoyed the cycle along the Railway Heritage Trail and found it easy to navigate and ride on. It is undoubtedly less physically challenging than the Munda Biddi. We appreciated being able to ride side by side through most of the trail. There are no sharp turns or leg burning hill climbs. Additionally with the number of handy access points there are plenty of options to complete the trail in shorter sections. Being 41km of off rode terrain, the trail is a decent length ride and it does gradually climb for extended periods. The Garmin logged a 386 metre ascent and we were definitely feeling it later on! In terms of cycling, the Railway Heritage Trail I would say is what the freeway path is to road cyclists – long straight stretches of riding. Except you’re cycling surrounded by beautiful bush! Its ideal for beginner riders who wish to try out off road cycling. We passed a few Mums and Dads teaching their kids along the trail. The trail is quite popular and for this it could perhaps be ideal for anyone that doesn’t particularly like the isolation of some of the true bush trails outside of the city. I would highly recommend a mountain bike or a bike with off road tyres. 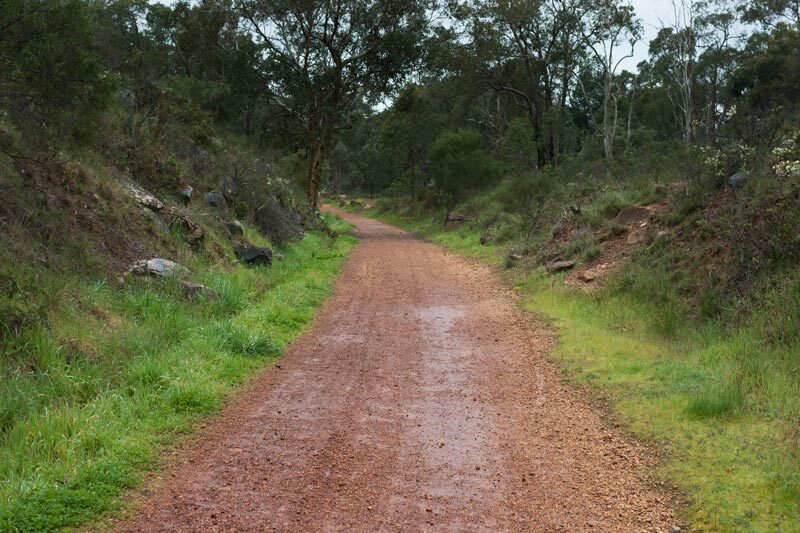 Although a hybrid would do okay particularly in the John Forrest National Park section you may find yourself walking the bike or pedalling hard in loose pea gravel, in certain sections if you decide to complete the entire trail. But hey, if you have time up your sleeve you’ll be able to enjoy the scenery over a couple of hours! 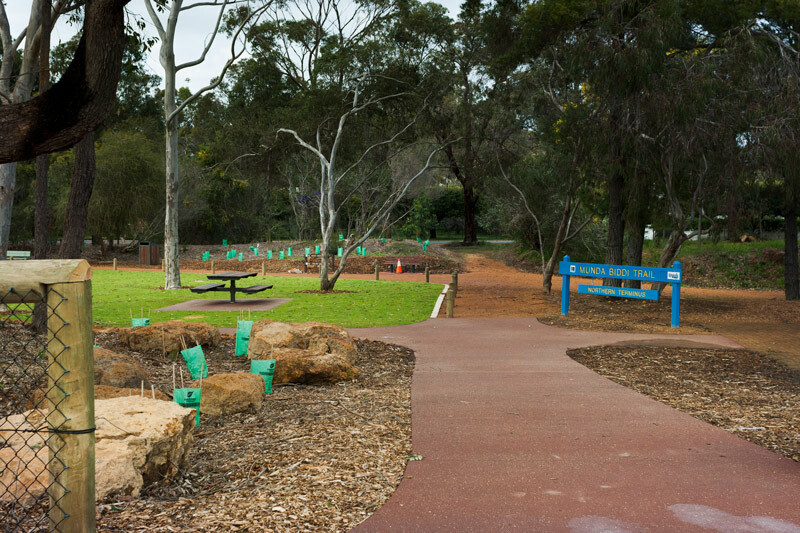 Interestingly the trail is a pathway for wildlife to coexist and move between green spaces which I think is brilliantly unique in Perth. I have no doubt in spring the area would be transformed with wildflowers! 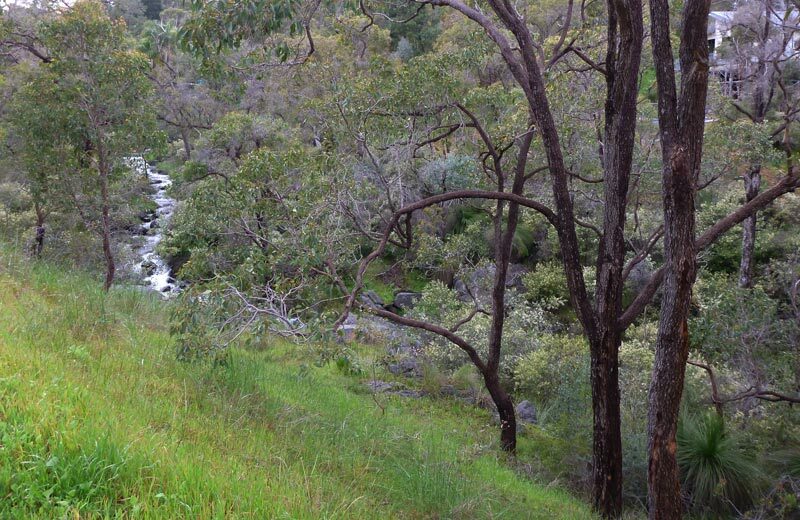 Being in fresh air surrounded by bush and encountering flowing water systems is incredibly relaxing.